The Wave Hub is a groundbreaking renewable energy project to create the UK’s first offshore facility to demonstrate the operation of arrays of wave energy generation devices. Many different devices are being developed in the UK and elsewhere to generate electricity from the power of the waves. 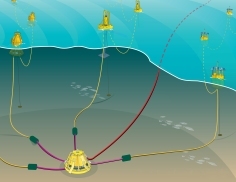 After the devices have been tested as prototypes elsewhere, the Wave Hub provides an area of sea with grid connection and planning consent where arrays of devices can be operated over several years. The infrastructure involves a sub-station building at Hayle adjacent to a connection point to the distribution network. From there, a cable will be taken through a duct beneath the sand dunes and then across the sea bed to an eight square kilometre area within which the devices will be moored. This area will be indicated with navigational markers. The system will operate initially at 11kv but can be upgraded to 33kv operation once suitable connectors and other components have been developed by the industry. The project will work with up to four different technologies at any one time. A 1km x 2km sea area will be leased to each developer for installation from 2010 onwards. Leases will run for approximately five years, and will allow each developer to generate a maximum of 4-5MW of power.